［急告］8/4開催！2020年東京にオリンピックはいりません。パレード！　JOIN US AUGUST 4! NO OLYMPICS PARADE! potlatchです。「2020年東京にオリンピックはいりません。パレード」キター！　JOIN US AUGUST 4! NO OLYMPICS PARADE! JOIN US AUGUST 4! NO OLYMPICS PARADE! It’s everywhere – in the street, on television, on the internet, and in the paper. There is one month left to go. As we get closer to the host city election on September 7th (September 8th 5am Japan time) the Olympic bid campaign in Tokyo is gathering momentum as strong as ever. We are here to express our opposition to this campaign run by Tokyo Metropolitan Government, Japan Olympic Committee, as well as the government and the mass media. 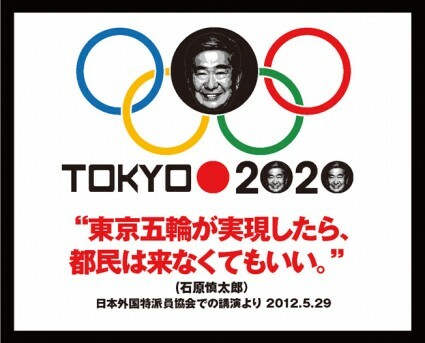 No to 2020 Olympics in Tokyo! NO TO TOKYO OLYMPICS PARADE! The march begins at 5:30pm. Bring noise maker, musical instruments, costumes and signs! Express your protest to the Olympics in your own style!